Frank McGovern set the New Jersey state record for the largest Chain Pickerel, at 9 lbs. 3 oz., caught in 1957 at Lower Aetna Lake. Members and guests should be aware that they must have a New Jersey fishing license in order to fish in the lake. Activity and guest tags must be worn while boating, fishing, or otherwise using our lakes. Nonmembers may not fish, swim, ice skate, or launch watercraft from lakeside property, public or private. The Colony will consider such action as trespassing. Docks- Visible portions must be constructed of wood. Must extend continuously from the shoreline. No floats, floating docks, or similar structures are permitted in the lake except those maintained by The Colony. No high diving platforms. The floor of the dock cannot be more than about eighteen inches above the normal high water level. Protective railings of reasonable height are permitted. Unlawful for a dock to be more than twenty feet wide or to extend more than twelve feet into any waterway. (Borough Ordinance No. 213). Only one dock permitted on any one property, unless one owner owns more than two hundred feet in frontage on any lake. In that case, The Colony has the discretion to permit one dock for each two hundred feet of frontage or fraction thereof. Swimming or bathing within twenty-five feet of the spillways of the Lower Aetna dam is prohibited. Using watercraft propelled by machinery, e.g.. outboard motors, including electric, except as authorized by the Borough or The Colony for maintenance or emergency purposes. Mechanically propelled model boats are also prohibited. Only watercraft propelled wholly by muscle power or sail are permitted. Members must obtain identification stickers for their watercraft in order to use them on The Colony’s lakes. The Colony issues such stickers to members each year, upon payment of fees for that year, only for watercraft owned by members. For several years, the Borough has required an inspection and certificate that smoke detectors are in good working order before a property can be sold. As of June 2002, a certificate of occupancy is now required certifying that no sump pump is present that discharges into the municipal sewer system. This same ordinance regulates how sump pumps must properly be discharged on an individual property. The Medford Lakes School District provides quality educational services to the residents of Medford Lakes Borough. 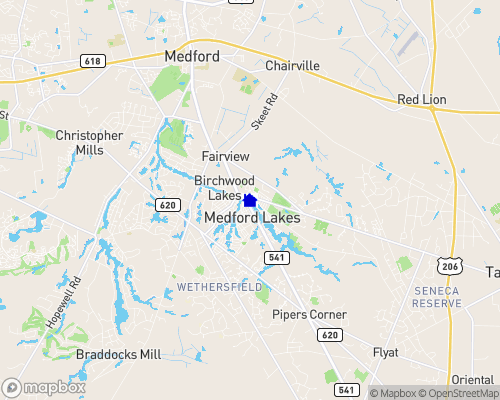 The Medford Lakes Borough is a nurturing, warm, and family-oriented community of lakes where the majority of students ride their bikes to school. The K-8 school district is comprised of two schools, K-2 Nokomis, and 3-8 Neeta, and has a total enrollment of 503 students. Class sizes range from 18-23 students at the primary level, to 24-27 at the intermediate and upper elementary levels. There is a class size policy in the District. Medford Lakes Schools has become a beacon district in Burlington County. In the New Jersey Department of Education's most recent Assesment Exam Test scores, 100% of Medford Lakes' eighth grade students demonstrated advanced proficiency or proficiency in the reading/language arts and mathematics areas.